MARINE CORPS BASE CAMP LEJEUNE, N.C. – Corporal Joshua M. McKee, a rifleman with India Company, 3rd Battalion, 8th Marine Regiment, 2nd Marine Division, received the Bronze Star medal with combat distinguishing device during an award ceremony aboard Marine Corps Base Camp Lejeune, N.C., Dec. 27, 2013. The bronze star medal is an individual military award of the U.S armed forces. It is awarded for acts of heroism, merit or meritorious service in a combat zone. When awarded for acts of heroism, the medal is awarded with a combat distinguishing device. The Bronze Star is the fourth highest combat decoration and the 10th highest U.S. military award. 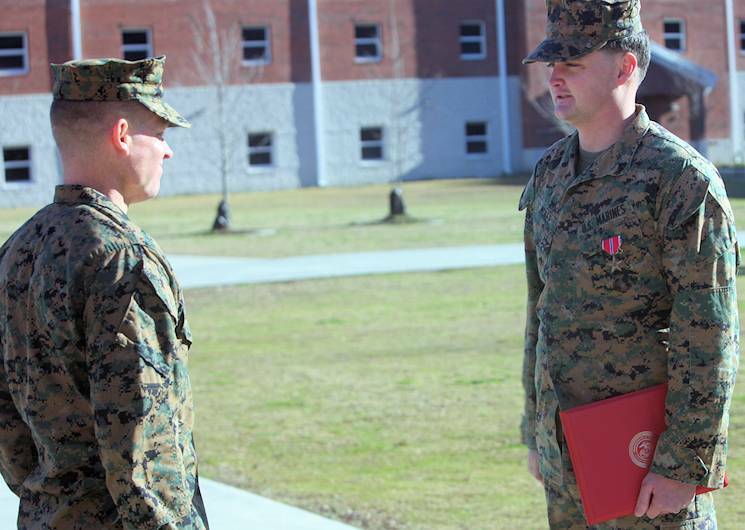 McKee received the award for his efforts during an insurgent attack while standing guard at forward operating base Hansen, during 3rd Battalion, 8th Marines' previous deployment to Afghanistan in support of Operation Enduring Freedom from May 2012 to Nov. 2012. While taking heavy fire, McKee took cover and was able to call for help. Among those present to congratulate McKee on his bravery, heroism and courage was 1st Lt. Jonathon Harris, whom also pinned the medal on McKee. During the deployment, Harris served as McKee's platoon commander and was present at the base during the time of the attack, and holds McKee in the highest regards. Today, nearly a year after the deployment, McKee is still dealing with some nerve damage but says despite it all, he wouldn't have changed his actions that day.